A new branch of social science that studies patterns of economic policies and practices by taking an integral, whole-systems approach to economic sustainability. The term "vMEME" (the superscript "v" is for "value") refers to a core value system expressed through a culture's memes, i.e., its ideas, habits, and cultural preferences and practices that spread from person to person. 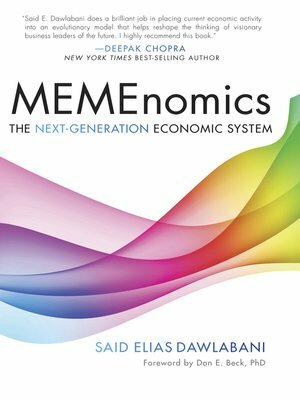 In MEMEnomics Said E. Dawlabani reframes our economic history and the future of capitalism through the unique prism of a culture's value systems. Focusing on the long-term effects of economic policies on society, he expands psychologist Clare W. Graves' concepts of the hierarchical nature of human development and the theories of value systems of Beck and Cowan's Spiral Dynamics. He presents our economic history in terms of the hierarchy of five of the eight value-systems or vMEMEs of human existence that we can now identify. These new value preferences emerge as people interact with their environment to solve the problems of their "life conditions." The author believes that the pattern of economic cycles resulting from cultural value systems is critical to understanding the evolution of the meme of laissez-faire capitalism. By demonstrating predictable cycles of our economic history through the spiral of evolving levels of cultural value systems, he argues for the need to change the course of failures inherent in our current system. Mr. Dawlabani then offers a solution to the viability of capitalism—the formation of a "smart model" of government designed from the values of the currently emerging seventh-level value system. Mr. Dawlabani calls on business leaders to evolve their values to the higher seventh-level system detailed in his "platform of functional capitalism." In this evolution of business consciousness, humanity moves from the myopic ethic of "subsistence" to a new frontier that champions the emerging ethic of the "magnificence of existence"—where we will all blend as part of a larger, compassionate whole.